sensory impressions are translated into overwhelming odors and tastes. 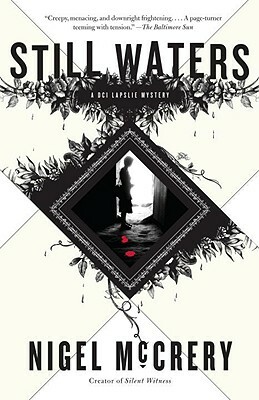 Razor-sharp and mesmerizingly eerie—with one of the most clever and ruthless villains to appear in ages—Still Waters is a stunning start to an exciting new crime series. DCI Mark Lapslie is called in when the decayed body of an elderly woman is unearthed. The body provides few clues, beyond the fact that the murderer had a deadly knowledge of household plants. The dearth of evidence is not Lapslie’s only problem. He’s just returned to the force after a year trying to overcome the worst symptoms of his synesthesia, a neurological condition that causes him to “taste” sound. The murder appears to be the work of a serial killer who could strike again at any moment, so Lapslie has to find a way to make his synasethsia work for him, not against him. Otherwise the next life taken could be his own. Nigel McCrery worked as a police officer before entering Cambridge University as an undergraduate. He is the creator of the acclaimed television series Silent Witness, and his screenwriting credits include several other programs for the BBC. He is also the author of many novels, including the Dr. Samantha Ryan mysteries. He lives in London. "McCrery's stellar thriller starts with a gruesome bang." "Creepy, menacing, and downright frightening. . . . A page turner teeming with tension." "Chilling. . . . Violet Chambers is the dark side of Miss Marple." "Highly original. . . . Arsenic and Old Lace meets the Galloping Gourmet in Still Waters, the first in a series of tasty mysteries." "This exquisitely macabre mystery will keep you firmly planted until the last page is turned." "Hook[s] a reader positively and absolutely. [McCrery is] expert at the fast-paced thriller." "Extremely creepy . . . Compelling." "McCrery introduces an excellent new detective . . . Highly original." "Arresting . . . Few readers will put the book down." "A fast-moving, original and often genuinely frightening novel." "Arsenic and Old Lace run wonderfully amok."